Pablo Picasso (Spanish, 1881 - 1973). "Picasso Linocuts: 1958-1963 [Baltimore Museum of Art]". Color silkscreen. 1969. Signed in blue crayon, lower right. Edition of c500. Light cream wove paper. The full sheet. Fine impression. Very good condition. Literature/catalogue raisonne: Cf. Bloch 1101; Cf. Czwiklitzer 276(a) (1970 ed. ); Cf. Czwiklitzer 329 (1981 ed.). Poster created (and exhibition held) during Picasso's lifetime, with Picasso authorizing its printing. A scarce poster; no auction records in the past 25 years located. Our present example of this poster is rare. The first exhibition by this name was held at The American Gallery, New York (The Computer Applications Incorporated Collection), April 1 to 30, 1968 (unrecorded by Czwiklitzer). It subsequently travelled to the Museum of Fine Arts, Boston (The Computer Applications Incorporated Collection) from January 28 to February 28, 1969 (Czwiklitzer 276(a), 1970 ed.). 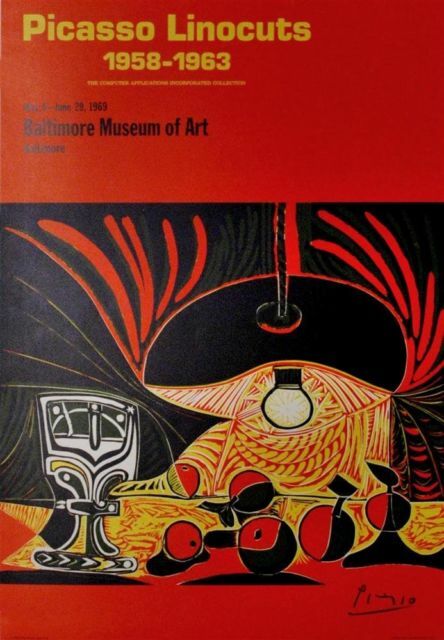 It then traveled to the Baltimore Museum of Art, Baltimore (The Computer Applications Incorporated Collection), May 6 to June 29, 1969 (unrecorded by Czwiklitzer). Its final stop appears to have been to The New York Cultural Center, New York (The Computer Applications Incorporated Collection), June 24 to September 20, 1970 (unrecorded by Czwiklitzer). All posters had the same Picasso linocut image, and all were printed by Triton Press, New York. Image copyright © Artists Rights Society (ARS), New York. Overall size: 28 7/16 x 20 in. (722 x 508 mm). 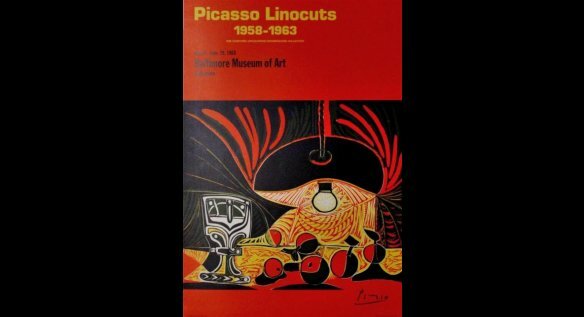 Title: "Picasso Linocuts: 1958-1963 [Baltimore Museum of Art]"
Size: 28 7/16 x 20 in. (722 x 508 mm).